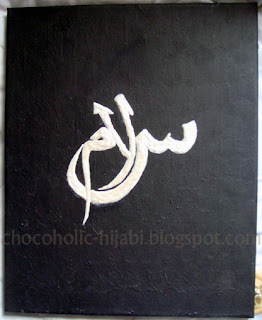 Trying my hand at Arabic calligraphy using fabric paint on canvas. Simple pearl white writing on black background. Canvas (stretched on wooden frame) from Poundland. Assalamualeikum dear sis! :) How are you doing? I love this piece, it's so simple and beautiful! You are great at calligraphy, mashaAllah!